The Perihelion fundraiser officially ended on Sunday (Pi Day) but I let it run a couple extra days to take advantage of the post-Pi Day shopping madness. During the fundraiser, the shops sold $932.89 worth of merchandise, $93.80 of which is markup. So, half of that works out to $46.90. I've rounded that up to $50 and sent the donation via PayPal to Engineers Without Borders. 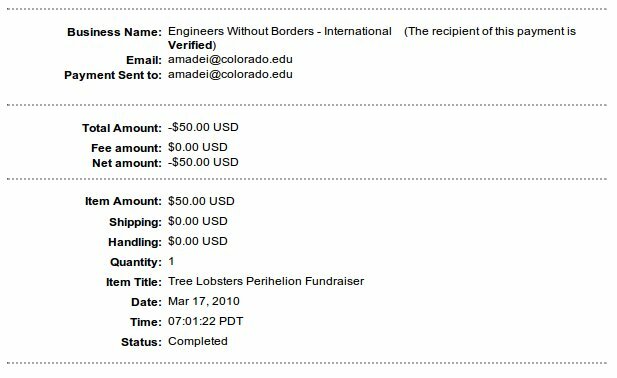 When I filled out the form, I entered "Tree Lobsters Perihelion Fundraiser" in the description field. Hoping that gives someone on the receiving side a double-take.